In 1997, there were about 29,647,000 people living in Tanzania. They are divided into 120 tribes; none have more than 10% of the population. Tanzania is a multicultural society with people from many different cultures. There are many languages & religions in Tanzania; the main ones being Christianity and Arabic. Tanzania is a very poor country. Their biggest export is the fish from the Lake Victoria, especially the nile perch. They send about 100 tons of fish to Europe and America every day. It's still not a lot of money. Most of the people in Tanzania work in agriculture. Agriculture in Tanzania is mainly very small farms. They grow coffee, cotton, sisal, tea, tobacco, and cashew nuts. The president of the United Republic of Tanzania is Jakaya Mrisho Kikwete. 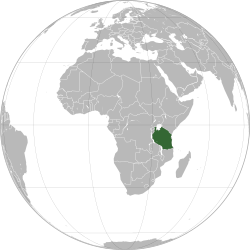 Tanzania is a member of the United Nations, UNIDO, the World Bank, the International Monetary Fund, the Commonwealth of Nations, the Non-Aligned Movement, SADC, PTA, and the ADB. It is also signatory to the Lome Convention. Mainland Tanzania (formerly Tanganyika) received independence in December 1961, while Zanzibar gained her independence in January 1964, through a revolution. The two countries joined together to form the United Republic of Tanzania in April 1964. Until July 1992, Tanzania was a one-party state. Following a Presidential Commission, the country has started a multi-party political system. It has held successful general elections in 1995 and 2000. ↑ 3.0 3.1 3.2 3.3 "Tanzania". International Monetary Fund. http://www.imf.org/external/pubs/ft/weo/2010/01/weodata/weorept.aspx?sy=2007&ey=2010&scsm=1&ssd=1&sort=country&ds=.&br=1&c=738&s=NGDPD%2CNGDPDPC%2CPPPGDP%2CPPPPC%2CLP&grp=0&a=&pr.x=86&pr.y=14. Retrieved 2010-04-21. ↑ "Gini Coefficient". CIA World Factbook. https://www.cia.gov/library/publications/the-world-factbook/fields/2172.html. Retrieved 2012-01-25. This page was last changed on 18 May 2014, at 19:21.